Blog RoofingWhat Makes a Good Commercial Roofing Maintenance Plan? New roof construction services providers agree that it makes sense to maintain your roof than spending big bucks to repair its issues all at once. In this scenario, your roof has several components that should be first on the inspection checklist. Enchantment Roofing describes these parts and why you need to prioritize them on your commercial roofing maintenance plan. Ventilation is essentially how your roof breathes, or more precisely, how it cycles out stale, warm air with fresh, cool air. It keeps the temperature of the roof manageable in summer and keeps it from drying out or becoming too brittle in winter. In addition, it keeps your roof from prematurely failing and minimizes your overall energy costs. Our complete commercial roofing services allow us to inspect your roof’s ventilation and if it’s inadequate, you can be sure that we’ll propose ways to fix it. Like any roof, whether residential or commercial, it’s a good idea to look at how the roof drains rainwater. While commercial roofs look flat, they actually have a subtle slope to help water run off, either in drains or scuppers and rectangular openings along the edges of the roof that allow water to slide through a downspout. Whatever the case, your roof’s drainage system should be one of the first things to prioritize when the time comes for roof maintenance. Standing water on a commercial roof causes it to degrade the protective membrane, even that of a modified bitumen roofing system, leading to leaks. Leaving debris on a commercial roof’s surface can wear it down prematurely. Tree branches, for instance, can scratch and puncture the top layer of flat roofs, while leaves can decay and invite vermin. Always clean your roof every few weeks to prevent these problems. Especially in metal roofing systems, flashing plays a role in keeping water out of edges, which can be penetrated by rainwater. Installation of flashing in a metal roof’s edges are extremely important. No matter how good the material, if it’s not installed properly—such as incorrect crimping or loose fastening— it will invetiably invite trouble. 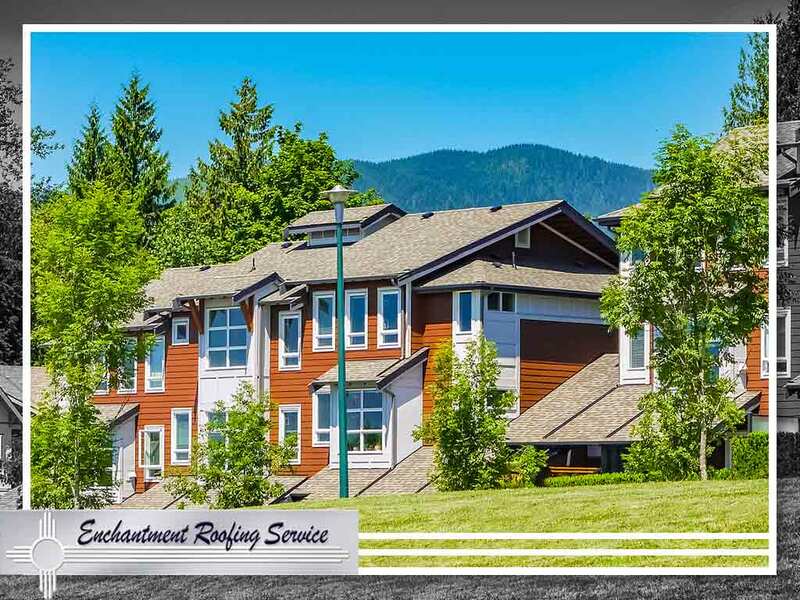 Enchantment Roofing is your residential and commercial roof repair service expert. Call us today at (505) 780-4616 to request a free estimate. We serve property owners in Taos, NM and the surrounding areas.